Our health is made up of thousands of seemingly unrelated pieces of information. Our genetics, our income, our blood pressure. Projects like the Precision Medicine Initiative partners with institutions like Veterans Affairs, Partners Healthcare and a dozen other health provider organizations to enroll and collect all such health data on individuals in order to understand health holistically. The aim of projects like the Standard Health Record from MITRE, FHIR from HL7, and CIMI, are to develop ways of organizing health information to manage our data and care in a useful way. Services can then compete on top of the open and well engineered architecture using the known rule set. Companies and citizens alike can drive towards more beautiful products, better access, and better care. This is where design comes in. Visualizing the representation of health data in a way that is understandable, touchable, and usable for humans. Design principles, values, and ideas around how our health should be delivered is what will drive that representation. 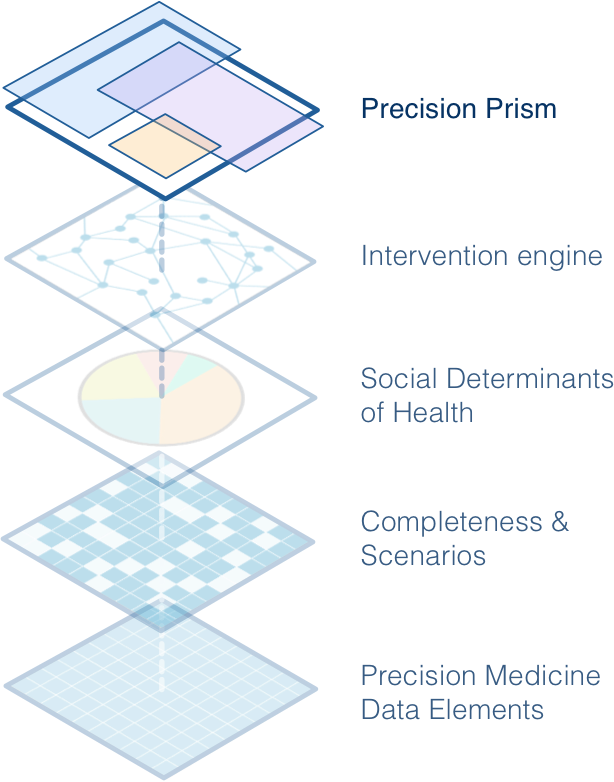 We want to ensure that these ideas are designed in a way that ensures that future precision medicine services are built to be accurate, usable, and human centric. Define the computable Precision Prism data elements for the core clinical and patient views. Designs of the clinician and patient views using the precision medicine data elements. Seed an open source design catalogue of precision medicine use cases, interaction principles and visualization techniques. Assemble a panel of healthcare key constituents to vet and become apostles for the precision health view. Firmly establish 20 global citizens to represent a diverse user group and establish 150 advisors to provide critical feedback and support for Precision Prism. EHR vendor or hospital system adopts the precision health view. Become the visual standard for precision medicine for the NIH and beyond.